Turns out I can make more than Mac & Cheese and Chili in a crockpot. Andy and I were wandering around the supermarket trying to figure out what to make for dinner when we stumbled upon whole chickens for less than $5. So we bought it… and then I realized I had no idea how to cook it. You see, my grandmother had one of those Ronco rotisserie cookers. Remember those? 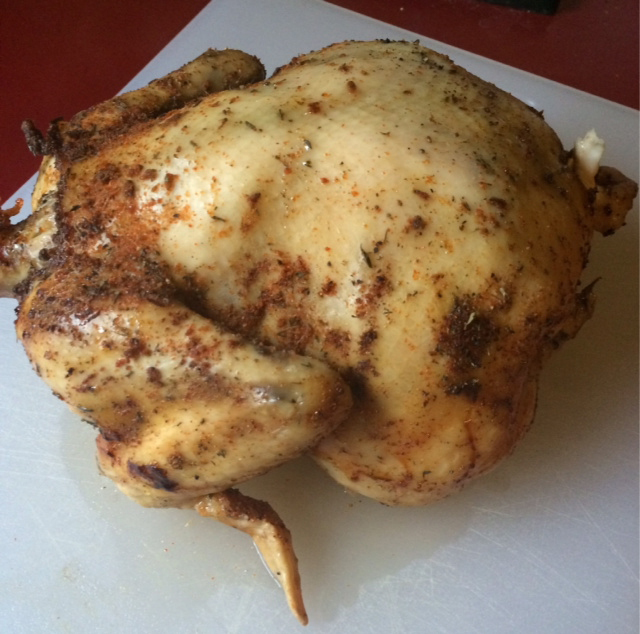 You could skewer a whole chicken, turn the nob and a few hours later, you’d had a roasted, juicy chicken. After we had lunch, my grandmother would always make me clean the chicken, pulling apart the meat from the bone for chicken salad the next day. Believe me, no chicken was ever wasted. I pride myself on being able to clean a chicken to the bone. Although to be fair, I might have snuck a few bites while cleaning the chicken. It was too tasty. So I thought about those meals when I decided how we were going to make dinner. And while I don’t have a home rotisserie, I did have a crockpot. Place two slices of bacon and onion on bottom of crockpot. In a small bowl, mix spices. Rub the spice mixture all over the chicken. You can even put some of the mix in the chicken cavity and under the skin, although not required. Place chicken in crockpot on top of bacon and onion. There is no need to add water. Cover and cook on low for 6 to 8 hours or until chicken is falling off the bone.